Book by Howard Ashman based on the Roger Corman’s Little Shop of Horrors. Music by Alan Menken. Lyrics by Howard Ashman. The premiere of the original Off-Broadway production took place on 27 July 1982. The original Broadway production opened on 2 October 2003 and was directed by Jerry Zaks with choreography by Kathleen Marshall, running for 372 performances. Like something from a B grade science fiction film, a godlike voice thunders prepares us 7of an evening of thrills, danger and intrigue before the lights reveal our narrators for the evening: Crystal, Ronnette, and Chiffon are three street urchins who exemplify the singing groups of the Sixties (PROLOGUE: LITTLE SHOP OF HORRORS). It has been a difficult life for Seymour Krelbourn. Brought up by a man named Mr. Mushnik, Seymour is an orphan and an outcast. Living on urban Skid Row, he works at Mushnik’s Skid Row Florist alongside a poor battered young woman named Audrey. A combination of Fay Wray and Donna Reed, she enters the shop one morning with a black eye that her date has given her. As they wait in vain for customers to arrive, Audrey, Seymour and the other inhabitants of Skid Row share their feelings about living DOWNTOWN. At closing time, Mushnik announces his decision to close the shop but Seymour comes up with a plan to save their jobs and the store. He shows Mushnik a strange and interesting plant he discovered, and which he has named Audrey II as a token of his secret love for Audrey. When he puts this strange looking flytrap in the window, customers flock to the store and he tells the story of how he found Audrey II (DA-DOO), during a total eclipse of the sun. Impressed by this amazing new draw card for his business, Mushnik offers to take Seymour and Audrey out to dinner. But Audrey already has a date and, as Seymour and Mushnik are about to embark on their own, Audrey II suddenly wilts and Seymour is commanded to stay at the shop and nurse the plant back to health. He begs the plant to grow (GROW FOR ME) and accidentally pricks his finger on a rose thorn while he cleans up the shop. Audrey II starts to perk up. When Seymour realizes that the plant wants his blood, he decides that he must feed it – but only a little because if he is a success Audrey might like him a little more. The plant amazingly starts to grow and is soon the size of a basketball. Seymour gets his first dose of fame when he gives his first radio interview some time later. As Mushnik, Ronnette, Chiffon, and Crystal, listen to the interview, they realize that it only goes to show YA NEVER KNOW. Unfortunately, Audrey misses the interview because her boyfriend had her handcuffed. But she really loves Seymour, although she believes her past makes her unworthy of his love, and dreams of raising a family with him in a beautiful suburb far away from urban Skid Row (SOMEWHERE THAT’S GREEN). Seymour makes an appointment to meet Orin at his surgery. Seymour takes a gun with him, but doesn’t need to use it. For Orin plans enjoy his appointment with Seymour by inhaling some nitrus-oxide. He puts on a special gas mask that gets stuck and he dies of suffocation (NOW / IT’S JUST THE GAS). Seymour feeds Orin’s carcass to the plant, while Mushnik watches in horror from the shadows (LITTLE SHOP OF HORRORS – REPRISE). The strange disappearance of Orin has made Audrey a free woman. And Mushnik and Son Skid Row Florist is abuzz with business (CALL BACK IN THE MORNING). After the day’s work, Audrey starts crying. Seymour reveals his feelings for her and Audrey reciprocates (SUDDENLY SEYMOUR). Later, Mushnik tries to blackmail Seymour into signing over Audrey II to him. But the plant – now as large as a car with two giant thorny tentacles – is hungry and Seymour escapes narrowly by feeding Mushnik to the plant (SUPPERTIME). Suddenly things start happening for Seymour. He is approached by Bernstein, a high spending, fast talking, television producer who offers him a contract for a TV gardening show; the wife of the editor of Life, who wants his picture on the cover; and a slick talent agent, who wants him to sign for lecture tours. Seymour is overwhelmed at the possibilities but nervous about the outcome of the continued feeding of Audrey II (THE MEEK SHALL INHERIT). One stormy night, Seymour is typing a speech and the Audrey II screams for food. Seymour decides that he cannot bear to feed the plant another person and goes to the butcher’s shop to buy some juicy cuts of meat for it. Meanwhile, Audrey, who lives across the road, cannot sleep (SOMINEX). She decides to take a walk and hears a voice coming from the shop. When she realizes that it is Audrey II, she is aghast. The plant begs her for some water – but it is all a trick and she is eaten (SUPPERTIME II). Seymour comes in at the last minute to save her, but she is dying. He confesses that he fed Orin and Mushnik to the plant and that he never meant to hurt her. She forgives him and lovingly begs him to feed her to her namesake as a sacrifice for Seymour’s continued fame. As a sunset appears in the background, Seymour dramatically feeds the dead Audrey to the waiting plant (WE’LL HAVE TOMORROW / SOMEWHERE THAT’S GREEN). Yet another opportunist, Patrick Martin, who wants to take cuttings of the exotic creature and sell them across the country, interrupts Seymour’s sadness. When Martin has left, Seymour turns to the plant realizing that Audrey II was sent to conquer the world. He shoots the plant, tries poison, and in desperation he picks up a machete and climbs into the plant to hack at its insides. The creature’s jaws close around Seymour and re-open to toss the machete to the floor. Martin returns with the urchins, whom he has hired to take cuttings of the plant. They move downstage, as the shop screen closes, to tell of the horrible fate of the world as entire towns were eaten by Audrey II’s offspring. The screen opens to reveal a nine foot tall Audrey II complete with four blood red flowers containing the faces of the dead Seymour, Mushnik, Audrey and Orin. They warn the audience: DON’T FEED THE PLANTS. FROM LEFT TO RIGHT: 1. Little Shop of Horrors Original Off-Broadway Cast CD. 2. Little Shop of Horrors Film Soundtrack CD. 3. Little Shop of Horrors Original Broadway Cast CD. 4. Little Shop of Horrors Karaoke CD. 5. Hey Mr Producer (with Live Excerpts from Little Shop of Horrors) CD. FROM LEFT TO RIGHT: 1. Little Shop of Horrors Non-Musical Film DVD. 2. 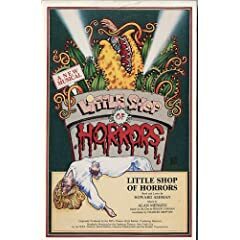 Little Shop of Horrors Musical Film Version DVD. 3. Little Shop of Horrors Script. 4. Little Shop of Horrors Vocal Selections (Film). 5. Alan Menken Songbook, including songs from Little Shop of Horrors.